Every few years we seem to get a new aspect of psychology that is ‘more important to success than intelligence’. In the 1990s it was Emotional Intelligence. In the Twenty-teens, it’s Grit. So what can we learn from a woman whose father told her that she was no genius? Well, when that woman has a string of academic, commercial, and social successes to her credit by her early 40s, perhaps we should listen to her. What are you really capable of? And what holds you back from achieving it? Competing against your own mental obstacles is the ‘Inner Game’. 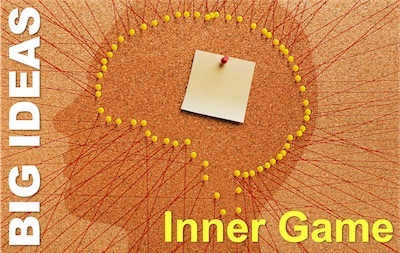 Although many people in the world of work have never heard of the Inner Game, nor of Timothy Gallwey, its founder, this big idea has been extremely influential. Because Gallwey and the ideas behind the Inner Game are very much the immediate progenitors of modern performance coaching. It it is hard to over-estimate the impact that has had on management and organisational life. Napoleon Hill has a lot to answer for. As if the 1980s’ and 1990s’ surge in the self-help book market wasn’t enough, you can now hardly move around the internet without the offer of a get rich quick scheme or the opportunity to build an amazing lifestyle with barely four hours of work a week. That isn’t to say, that Hill was the first into the market, but he was, perhaps, the first and most important contributor to our literature on personal success. 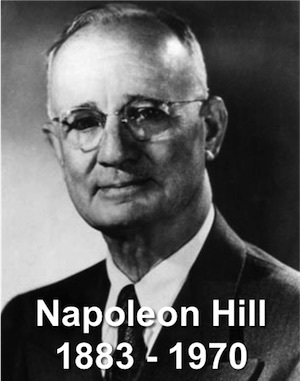 Napoleon Hill was born into a fairly impoverished Virginia family, in 1883. He was 10 when his mother died, and quickly became something of a local menace, roaming the locality with a six-shooter, trying to emulate his then hero Jesse James. It was his stepmother who pointed him in a new direction. He was to find new heroes in America’s great industrialists, and to learn that the typewriter is mightier than the handgun. At 15, he started a journalistic career, writing articles for local papers, which led, in 1908, to his first big interview, with ageing steel magnate Andrew Carnegie. Over a couple of days, Carnegie shared his philosophy on how he became successful, while Hill sat rapt. At the end, so the mythology goes, Carnegie challenges Hill: if Hill would dedicate himself, unpaid, to researching a philosophy of success, Carnegie would get him started with letters of introduction. Hill accepted and got a personal introduction to Henry Ford. This led to further introductions that allowed Hill to interview such ‘great men’ as Alexander Graham Bell, Woodrow Wilson, Thomas Edison, and Elmer Gates. In a short biography, we don’t have time to detail the many achievements and setbacks that Hill encountered in his life, including his work as PR advisor to US President Woodrow Wilson. But lasting success appeared to have arrived when, in 1928, Hill was able to publish his eight-volume analysis of everything he had learned on the quest Carnegie had set him. With the proceeds of The Law of Success, Hill bought an impressive new family home. Sadly, another reversal came in 1929, when the Wall Street crash took book sales with it. The Hills were destitute. There followed a series of ventures and adventures in a colourful life that saw Hill working for another US President, FD Roosevelt (and, it is claimed, penning the famous ‘we have nothing to fear but fear itself’ line), launching several magazines (that all folded in a variety of circumstances) and surviving, by pure good fortune, an attempted assassination attempt by prohibition era gangsters. But let’s cut to the chase. In another attempt to revive his fortunes, Hill re-wrote and shortened his Law of Success ideas into a new book. Hill did this at the prompting of his second wife, who also suggested the (early 2000s -sounding) title ‘The Thirteen Steps to Riches’. His publisher rejected this with a suggestion of his own – which was mercifully abandoned. The book we now know of as Think and Grow Rich, was very nearly titled: ‘Use Your Noodle to Win More Boodle’. More good fortune and ill were to follow, as were more magazines and more books. Perhaps the most significant of these reads a little like a summing up. Teaming up with businessman W Clement Stone from the early 1950s, the two men taught his philosophy of personal achievement. In 1960, they co-wrote Success Through a Positive Mental Attitude. More books were to follow – including some finished and published posthumously. In 1970, Napoleon Hill died. He had arguably achieved even more than his mentor. Whilst Hill was never remotely as rich as Carnegie, it is Hill’s book that is constantly re-issued and labelled as a classic. But there is more to Hill than pithy quotes. In his evocation of ‘brain capital’ in Think and Grow Rich, Hill arguably foresaw the growth of Charles Handy’s Triple-i Company. It is also important to acknowledge that Hill’s philosophy (like many of the men he interviewed) was rooted in an early twentieth century Judeo-Christian tradition of hard work, male dominance, and biblical foundation. Some of his writing may seem ahead of its time, but other aspects are very definitely of the past. His focus on a will to succeed (compare this to Nietzsche’s ‘will to power’) as a transmutation of male sexual energy reads as nothing more than bizarre to a modern reader. But his concept of a group of intelligent, challenging individuals surrounding you as a means of accessing knowledge and wisdom, which he called a Master Mind, is probably the origin of modern Mastermind groups, which doubtless are responsible for much business success today. In Think and Grow Rich, Hill alludes to his secret of success, without making it explicit. Most people therefore infer it to be some variant of a passionate, almost ungovernable urge to succeed. This is certainly a theme that recurs. It is also worth mentioning that Hill defined wealth far more widely than financial success, but as the quality of your friendships, the harmony of your family life (coming from a man twice divorced), and good working relationships. This last point is vital. This is a variant, of course, on the oft-cited and truly multi-cultural Golden rule: that you should treat others as you would wish them to treat you. But it was in the 1950s and with the publication of Success through a Positive Mental Attitude that Hill described his settled opinion. People who succeed tend to be those who view setbacks as nothing more than a step on the road to success. A positive mental attitude, which finds its modern form in Positive Psychology, Learned Optimism, and a Growth Mindset is Hill’s final secret to success. And it seems a fitting one. Because few people in our Great Thinkers and Doers series have suffered so many setbacks, and mounted as many comebacks as Hill. His final success serves as one data point in the anecdotal confirmation of Hill’s self-help secret. You may like The Growth Mindset Pocketbook and The Positive Mental Attitude Pocketbook. What are the best predictors of success in life? Daniel Goleman’s book Emotional Intelligence blew the bottom out of general intelligence for most of us, back in the mid 1990s. One facet of emotional intelligence is motivation, and this is front and centre of the work of another psychologist. 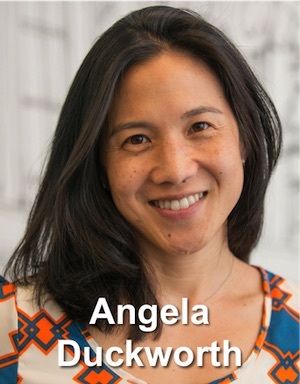 Angela Lee Duckworth’s research interest is competencies other than general intelligence that predict academic and professional achievement. And she has been putting the spotlight on two of them: self-control and perseverance. Angela Lee was born in 1970, and grew up in New Jersey. She was the third child of immigrants from China, who had fled the cultural revolution. The parents were exceptionally results-oriented, leading to three children who have all excelled. However, as the third child, Duckworth recalls feeling a sense of benign neglect, as her parents focused their attention on her older siblings. She was exceptionally bright and worked hard, entering Harvard and graduating in neuro-biology in 1992. Two years later, she took up a scholarship to study neuroscience at the University of Oxford, leaving with an MSc in 1996. From there, she joined consulting firm McKinsey and Company (where she met her husband, Jason Duckworth). Promised opportunities to do pro bono work, but being allocated work in the pharmaceuticals sector, Duckworth left and started teaching, first in New York. During this time, she started paying attention to why some children succeeded and others failed. 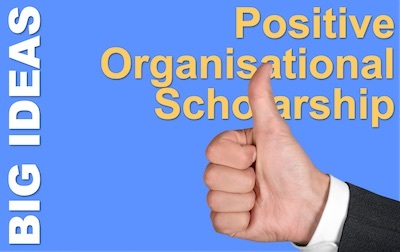 She joined a doctoral program at the University of Pennsylvania, in the Positive Psychology Center, under the leadership of Martin Seligman, who supervised her study. She was awarded her PhD in 2006 and took up an academic post there. She is now a Professor of Psychology and leads the Duckworth Lab, which focuses on two traits that predict achievement: grit and self-control. the voluntary regulation of behavioural, emotional, and attentional impulses in the presence of momentarily gratifying temptations or diversions. These two are different. Grit equips you to pursue especially challenging aims over long periods; years or even decades. 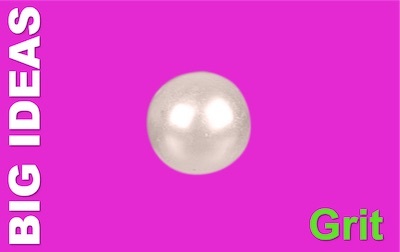 Self-control operates at a short timescale in the battle against distractions and temptations – willpower, if you like. Duckworth’s research shows that the two are related, but not totally correlated. People who are gritty tend to be more self-controlled, but the correlation is not total: some people have masses of grit but little self-control, while some exceptionally self-controlling people are not especially gritty. Her team has developed non-commercial scales that measure each. Duckworth’s research has found that, when they strip out the effects of intelligence, grit and self-control predict objectively measured success outcomes. They have used contexts as diverse as children’s spelling competitions, military officer training, and general high school graduation results. Because of the importance of these factors, therefore, Duckworth has introduced them into the routines for her family: husband and two daughters. Academically, her team is researching ways to instil self-control and grit into children. She has shown that children can learn and practise strategies to build grit and self-control. In a recent Pocketblog, we looked at the work of Carol Dweck, on Growth Mindset. Duckworth sees Dweck as a role model and is collaborating with her because she has found that children who have more of a growth mindset tend to be grittier. Once again, there isn’t a perfect correlation, but enough to suggest that one of the things that makes you gritty is a growth mindset: the attitude ‘I can get better if I try harder’. This should help you to be tenacious, determined, and hard-working: gritty. Angela Duckworth’s 6 minute talk on Grit is one of my favourites and has over 6 million views. She is also working on a book, Grit: The Power of Passion and Perseverance due for publication in early 2016. Orpah Winfrey (not a mis-spelling) was born into poverty and hardship in 1954 and rose to become both a celebrity phenomenon and a business magnate. Along the way she made many astute decisions. 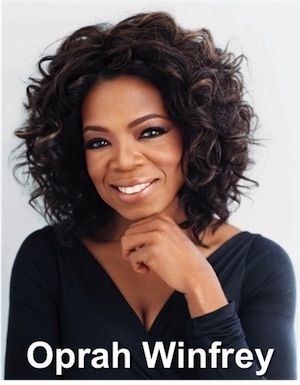 One of the first was to change her name, recognising that if too many people mis-pronounced Orpah as Oprah, then she may as well go with the flow. Part of her skill has been an adept assessment of the direction of flow. There is far more biographical detail available about Oprah Winfrey than most other of our management thinkers, so let’s stick to summarising a few of the facts most relevant to our theme, and leave the more vibrant details to other sources. Many of them have been revealed on her TV shows and in her books – others have emerged through unauthorised tabloid revelations. Winfrey’s early years in rural Mississippi with her grandmother, urban Wisconsin with her mother, and Tennessee. She experienced much hardship and poverty, including serious abuse, teenage pregnancy, and bereavement. It was while living with her father for a second time that she started to succeed at school, enter Tennessee State University and land a news job on the local radio station, WVOL in Nashville. This led to a news anchor role at the local TV station, WTVF-TV (then WLAC-TV). She was a television natural and had evident star quality. In 1976, she moved to Baltimore as a news co-anchor at WJZ-TV, which didn’t work out well for her, but the senior executive at the station suggested she co-host a chat show instead. Although she was reluctant at first, and both she and the station considered it a risk, this was her defining moment: the audience loved her and the show’s ratings rose rapidly. In 1984, she took on a new role as host of WLS-TV’s prime morning talk show, AM Chicago, broadcast head-to-head with the top-rated talk-show, hosted by Phil Donahue. Within a month, it was Winfrey who rated number one. In 1985, she co-starred in Steven Spielberg’s multi-Oscar-nominated movie, The Color Purple, winning an Oscar nomination herself as best supporting actress. The following year she launched her nationally syndicated show, The Oprah Winfrey Show. Her style of being open and honest with her emotions made her a national hit with many millions of viewers. Two years later, her astute business sense became evident, as she bought the rights to her own show, set up a production company (Harpo – Oprah backwards), and build a $20m studio in Chicago. After Mary Pickford and Lucille Ball, Winfrey was the third woman to own a major US studio. Hwer business life continued and continues to be a huge success, making her a multi-billionaire. What Business Lessons can we Learn from Oprah Winfrey? It is easy to think of Winfrey as a media celebrity: her TV chat show is the foundation of her business empire and she has 22 credits as an actress. But she is producer on half as many again films and TV shows and she is owner of a huge portfolio of media assets including TV networks, production companies, and magazines. The value of sheer grit and determination. Yes, Oprah surely has talent, but to triumph over the hardships she faced, Winfrey needed hard work and persistence. Throughout her life, she struggled with setbacks, but has always pushed forward. Recognise your strongest assets, and take control of them. From her earliest exploitation of her talents as a speaker when she went to a local radio station to collect a prize for winning the Miss Black Tennessee beauty pageant, Winfrey has spotted her opportunities well and taken control. The best example is her decision to buy out the rights to her TV show and become its producer. This was a big risk and most hosts are content to stay just that: Winfrey was not. This is what made her a media mogul, rather than a media celebrity. When rivals start to challenge you, shift ground to differentiate yourself. In the early 1990s, the Oprah Winfrey Show was a huge success and therefore, inevitably, widely copied by other producers. Everyone was interviewing anyone with a tale of woe, and the more salacious the better. Amid this race to the tabloid bottom, Winfrey took a step upwards. She started to produce uplifting shows that she started to call ‘change your life TV’. Instead of wallowing in people’s misery, she offered audiences a choice of improvement… which they loved. In transforming her show, she charted her way to where she sits now as a celebrity: a champion for highbrow self-help (and, to be fair, some practitioners offering advice that is less than empirically validated). In 2003, Michael Moore wrote that Oprah should run for US President. That would be a shift, and it would take grit too. Will she do it? For more about her career and her advice to listen to your instincts, here is an interview (c.65 min) she gave at Stanford’s Business School in 2014. 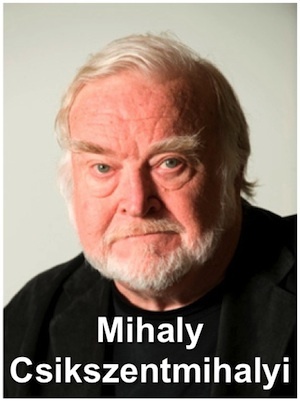 Mihaly Csikszentmihalyi is a US psychologist at forefront of the field of positive psychology; the study of human strengths and how we can have a happy, flourishing life. His research into flow states has made a famous figure among specialists and interested general readers alike, with several books including his two best-sellers: Flow: The Psychology of Optimum Experience and Creativity: Flow and the Psychology of Discovery and Invention. Csikszentmihalyi was born to a Hungarian family in a city long disputed by Hungary, Italy and Croatia – now called Rijeka and part of Croatia; it was, at the time of his birth in 1934 a part of Italy, named Fiume. He emigrated to the United States at the age of 22, and got a BA and PhD from the University of Chicago, going on to become a a professor and chairman of the Department of Psychology. He is the founder and a co-director of the Quality of Life Research Center – a non-profit research institute that studies positive psychology. 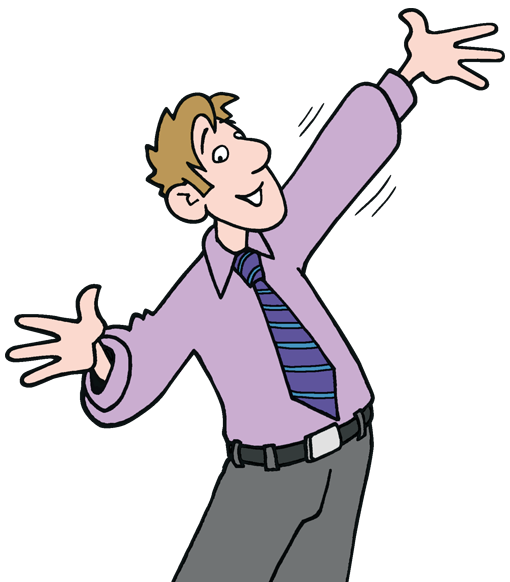 For more details on Flow, see our earlier blog: Flow and Performance Management. It would be easy to write a long blog about Csikszentmihalyi’s contributions to positive psychology, but from a management perspective, I want to focus on his work on creativity, in documented in his book: Creativity: Flow and the Psychology of Discovery and Invention. Becoming immersed in a problem that is interesting and arouses curiosity. Ideas churn around at an unconsciousness level. The “Aha!” moment when the answers you reach unconsciously emerge into consciousness. Evaluating the insight to test if it is valuable and worth pursuing. Translating the insight into a workable solution – Edison’s ’99 per cent perspiration’. This to me explains why we seem to get our best ideas when out walking, sipping a coffee, or in a shower. These are not the times when we solve our problems: they are the times when our conscious mind is sufficiently unoccupied to notice the answers that our unconscious has developed. You need to give people time to understand and research the problem, making it as interesting and relevant to them as you can. You need to let people go away and mull, allowing a reasonable period for ideas to incubate. You need to bring people back together with no distractions and pressures, so that the ideas can naturally emerge. You need to create separate stages of your process for evaluating the solutions and then for implemental thinking, when you hone the preferred solution into a workable plan. Ingvar Kamprad is not a familiar name… but his initials, and those of the farm and village where he grew up, are. Ingvar Kamprad grew upon the family farm, Elmtaryd, near the village of Agunnaryd. And in 1943, the company he started at the age of 17, which sold a random mixture of goods by local delivery and, later, by mail order, was called IKEA. The story of how Kamprad went from pens and picture frames moving around locally on a milk van, to one of the richest people on the planet is instructive: not just for entrepreneurs, but for anyone who manages a part of an organisation. 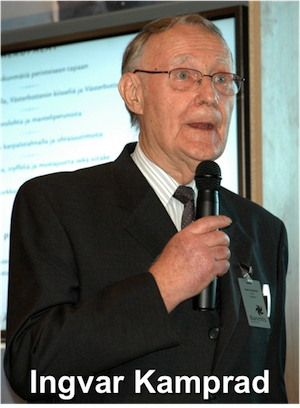 Kamprad was born on the family farm in 1926, in the southern Swedish province of Småland. His first retail goods were matches, which he resold to his neighbours when he was five. He moved on to catching local fish and picking local lingonberries, and sending them by bus to his buyer. He founded IKEA in 1943 while working at a full time job, and it was only in 1946, when he completed his national service, that he saw the opportunity to move IKEA towards being solely a furniture retailer. By the 1970s, IKEA had stores across Europe, and by the end of the century, it was in 30 countries, with a mailing list for its famous fat catalogue, of 100 million. Now retired and a tax exile in Switzerland, Kamprad eats modestly, flies economy, and haggles with market traders. It would be wrong to ignore what Kamprad has described as “The Greatest Mistake of My Life” – his early association with Swedish pro-Nazi fascists. The extent of his involvement and the degree of his remorse is something for historians and Kamprad to consider. In 2001, IKEA opened for business in Israel. In reading a story of Kamprad’s life, I have spotted five defining ideas that seem to me to have made all of the difference. None of them is exclusive to the retail industry, much less to the furniture trade. If only my father (a near contemporary of Kamprad’s and also in the furniture trade)… But then, we are who we are, and I wouldn’t swap for a moment. IKEA is famous, among other things, for its cafes. On the first day of opening his first furniture warehouse, Kamprad promised every customer coffee and a bun. To get there, they would have to travel a long way, in harsh, cold weather conditions. When he opened the door on that morning, there were over 1,000 people patiently waiting. IKEA is also famous for self-assembly, self-service, and minimal packaging. Each of these is designed to reduce costs to IKEA and so to their customers. Kamprad was always, and still remains, conscious of every last Krona, Euro, Pound or Swiss Franc. In the 1950s, Kamprad’s competitors became jealous of IKEA’s growing success. They struck back with unsavoury tactics that would have crushed a less determined person. They pressured suppliers to not serve IKEA, and they got the company banned from trade fairs. Kamprad’s resilience and ingenuity turned these potentially fatal setbacks into triumphs: he started to design and build his own furniture, owning the whole supply chain, and he bought his own exhibition centres. It is easy to think of the distinctive blue and yellow colours and block capital font of the IKEA logo as its brand. Kamprad did not. He said that the product range was the company’s identity. And I think he was right. Whether it is the distinctive simplicity of the Billy bookcase or the cutesy accessories like the Spöka nightlight, we recognise IKEA products whenever we go visiting. IKEA has not stood still. Not only is their product range frequently refreshed and the showrooms re-dressed often, but IKEA has constantly innovated in the way it goes to market and delivers its services. Last week we looked at some tips if you want a new job. But what if you want to stay in your current job, but want it to feel like a new job? If only there were some way to revitalise your current job. Well maybe there is. 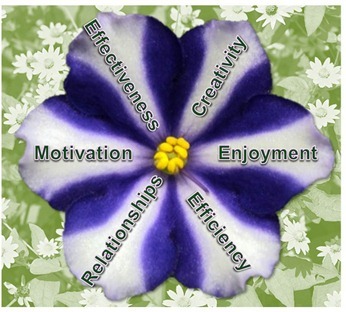 And it all starts with the Flower Model of Job Satisfaction. Lets take each petal at a time and see what you can do to boost your job satisfaction. Effective action on two or three of these could transform the way you feel about your current job. The Need for Power: a desire to be in control – of yourself, yes, and others maybe. Certainly you will look for respect. The Need for Affiliation: a desire to be part of a team and to relate to other people, working together and being recognised for your contributions. The Need for Achievement: a desire to do things, do them well, see results and sense progress. Whatever you discover motivates you, look for ways to get more of it in the balance of your work. If getting things done and making a difference matters to you, then look for ways to take a more strategic perspective on your work. What choices and decisions have you been pretending you can’t make? It is time to be more precise in what you choose to do, and to seek more responsibility for making a difference. So start with ‘what is the purpose of my job?’ and work towards focusing more on that and less on the trivia. Get involved in projects, take part in change, review how you do things or what else your organisation could do to serve your clients or customers. Take time out to think, experiment and play. Start to look for the fun in the things you do day-to-day: maybe a robust argument about the next marketing campaign, perhaps a chance to design a new window display, possibly a decision to learn new techniques that will make you better at your job. With the right attitude, discussion, design and learning are all fun – and so is just about anything. Focus on one thing and look at how you can do it as well and efficiently as you possibly can. Flow states are the optimum state of pleasure for humans. We reach them when we stretch ourselves to the limit of our capability, so transform a dull repetitive task to a striving for efficiency and not only will you free up time for creativity or relationships or enjoyment, but you will have more pleasure doing the task. The average worker spends more of their waking hours with work colleagues than they do with their family. So make the most of it. Look for new ways to enjoy the company of your colleagues – or look for new colleagues within your organisation whose company you can better enjoy. Please Note: This is in no way a recommendation to try out an inappropriate workplace relationship. Far more often than not, it will end badly and make things a whole lot worse! The Positive Mental Attitude Pocketbook will give you a heap of hints how to transform your attitude to a job you are starting to tire of. The Management Models Pocketbook has a chapter on David McClelland’s model of motivational needs. The Improving Efficiency Pocketbook will give you a load of ideas for… improving efficiency. The Working Relationships Pocketbook will.. well, you get the idea.